Yesterday I wrote that I wanted to increase my run cadence, but wasn't sure how to approach it. I got a comment from fellow running blogger, The Petite Pacer, who suggested I try a metronome phone app. 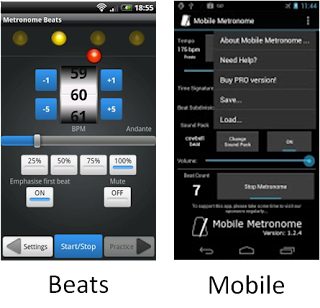 That was a great idea and I downloaded a couple of free ones, Metronome Beats and Mobile Metronome. After researching how to use a metronome for cadence, I was good to go. 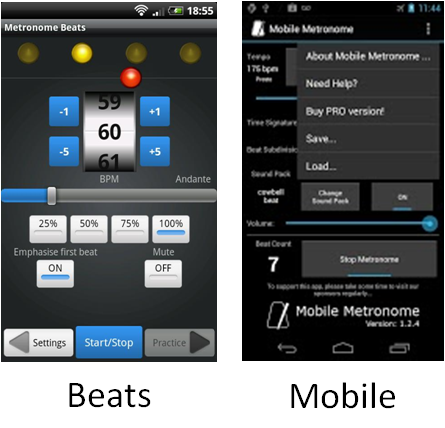 I decided to use Mobile Metronome first, and set the BPM at 85, which is undoubtedly higher than my current SPM. Back when I used a foot pod, my cadence typically averaged 80 SPM on the road and 83 SPM on the treadmill. I wanted to set an aspirational cadence, rather than start with the ideal of 90/180 SPM. I was curious whether I'd be able to sync my steps with the metronome's rhythm. I always run with my phone and I keep it in a SPIbelt on my waist. Even after setting both the phone and application volumes to their maximum, the sound of the beat was faint. Under normal conditions I could hear it, but the occasional sounds of helicopters, lawnmowers and passing school buses would drown it out. The challenge of matching stride with beat was a little tough. I decided to let it happen naturally by focusing on the beeps. I'm not sure that I achieved my targeted cadence today, since I have no way to capture the metric. I felt like I was on top of the beat, but it's hard to really know. My overall pace, a pedestrian 9:37, doesn't indicate fast turnover. Tomorrow I'm going to try the Beats app that provides the option of beat pairs that could help me sync both steps. The app also offers more ways to shape the sound, so I'm hoping it will be easier to hear, even with lots of background noise. The heck with the technology, go to the track once a week and do 7 or 8 440s at 5k pace or better. Or even better, do them on the treadmill and kill two birds with one stone -- increase your speed and avoid the monotony of the dreadmill. Set that treadmill to a 7:00 minute mile pace, and your cadence will follow. I just started doing this at the urging of a friend, and I have seen amazing speed gains in a short period of time. And the interval training makes the treadmill running so much more bearable than just plodding along while looking at that darn clock like the proverbial pot of water which never boils. I love your suggestion and you are, of course, right. I did a few track interval workouts prepping for Cow Harbor in hopes of gaining speed. I didn't do 440's at race pace, it was more like 12 x 100 sprints. I don't like the treadmill either and occasionally use it for speed runs - more farlek than intervals though. And if I could run a sustained 7:00 pace, I wouldn't be worried about cadence! You could maintain an 8:00 pace for a 1/4 mile without any problem. 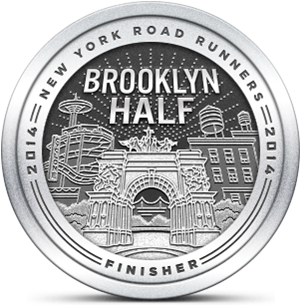 Knowing your present abilities as a reader and from my own recent experiences, here's what I'd suggest -- half mile warm up at about a 10:45 pace; quarter mile at 8:00; 1/8 mile at 10:45; repeat six or seven times; half mike cool down at 10:45. Do that once a week for a few weeks, and you'll be programming those intervals in the mid 7's in no time, and experiencing demonstrable speed gains in month. I'll try that workout, or as much of it as I can. Unlike the Petite Pacer, I am not a fan of the track. Give me the trails any day. I doubt I'll ever get under 8:00 on a regular basis, but it would be great to do that. Do it on the treadmill. You will love it. That is an encouraging experience. I'm going to play with the metronome and try to get to 90/180. Good point on the type of learners. I have to say that focusing on the sound helped distract me from the effort. This could lead to improvement.